STEP 1: Take your three different styles of washi tape and start to cut different sized triangles out of them, these can be any size you want but we decided on 2 long triangles and 1 short triangle. Then start to place them around the outside of your plate. STEP 2: Do this until the entire place has a cute washi tape border all the way around. STEP 3: Take your smaller plate and simply stretch out long strips of the washi tape around the outside. We used two strips of each colour to make sure it looked relatively even. STEP 4: Wrap a piece of your washi tape around the top of the handles on your cutlery! This looks best if you stick to one pattern. STEP 5: Next it’s time to decorate the jar! Take one colour of your washi tape and cut a triangular shape into the end, then wrap it around your jar. You don’t have to go all the way around, just enough to create a nice strip of colour onto the jar. STEP 6: Finally repeat with the other two styles of tape and you’re done! You may also want to wrap a bit of tape around a straw for the jar then lay out the table however you think works best and voila! 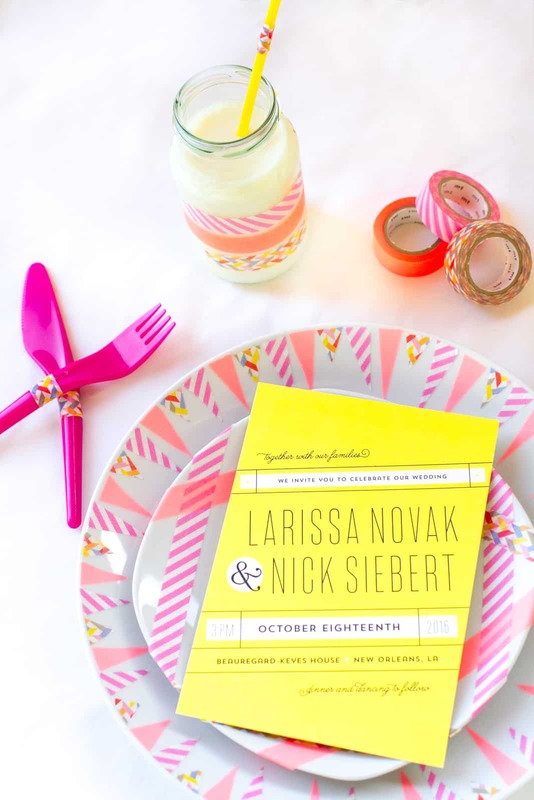 You have your very own washi tape place setting! How cute is that?! If you’d like to get your hands on those gorgeous yellow invitations too you can do so on Minted! And don’t forget if you’d like the same mt washi tape as us then just head on over to Stone Gift to get your hands on some, they’ve got a great selection over there!